Don’t lose sleep. Lose bed bugs. Bed Bug Killer Powder is the vital component of our effective bed bug extermination solution. The powder is a powerful, 100% natural weapon lethal to bed bugs but non-toxic for humans and animals. When used as recommended with Bed Bug Proof Mattress Covers, Bed Bug Barriers and the Bed Bug Steamer (an essential for slat beds), you’ll sleep soundly knowing that you’ve single-handedly deployed a strategic attack to wreak permanent destruction of these blood-sucking parasites. Non-Toxic for Humans and Animals. Deadly to Bed Bugs. Bed Bug Killer Powder is as simple as it is effective. The mined powder is a crumbly sediment formed from the skeletal fossil remains of tiny aquatic organisms. To humans, the powder has a slightly abrasive feel but to bed bugs, the texture is razor-like and inflicts terminal injury as the bugs crawl through it. Put simply, Bed Bug Killer Powder is sand that kills bed bugs but is non-toxic to humans, pets or wildlife. It is a scientifically tested, registered organic product approved by the Australian Pesticides and Veterinary Medicines Authority (APVMA). This APVMA registration verifies the powder’s effectiveness and safety. How does Bed Bug Killer Powder Kill Bed Bugs? To survive and breed, bed bugs must crawl to their next blood host because they can’t jump or fly. By restricting the bed bug’s movements using Bed Bug Barrier Products, bed bugs are left with no option but to crawl through Bed Bug Killer Powder on their search for nourishment. As they do this, their protective waxy exteriors are destroyed by the highly abrasive powder, causing death by dehydration. The complete Bed Bug System* is 100% effective in stopping or preventing a bed bug infestation of your property while your guests and pets sleep comfortably. If you follow the complete Bed Bug System (see the video below) we guarantee you’ll never need to share your bed with bed bugs again, or we’ll refund your money in full. If you’ve ever faced a bed bug infestation, you’ll know chemical pest control methods mostly keep bed bugs quiet for a few days or weeks. Once the nymphs hatch, a follow up dose of toxic insecticides is required. And, if just a couple of bed bugs have crawled into the safety of a crevice during treatment, you’ll be calling the pest control company back again. Professional pest control methods can end up costing thousands of dollars with no guarantee of a permanent solution. Meanwhile, bed bugs have also evolved and built resistance to chemical insecticides. Bed Bug Killer Powder is a physical method of terminating bed bugs ( think… the equivalent of crawling through razor-sharp grains of sand ), so building resistance is not an option for them when it comes to facing Bed Bug Killer Powder! In the same study, Bed Bug Killer Powder was found to inflict a 100% mortality rate on all strains of bed bugs tested. Take charge by investing in a flexible, do-it-yourself way to get rid of bed bugs. Bed Bug Killer Powder gives you full control. The Bed Bug Killer Powder can take up to 10 days to kill adult bed bugs, while first stage nymphs die in about 24 hours. When it comes to beds with slats, there are literally thousands of places for bed bugs to hide, so the bed slats need to be steamed for instant protection. Use the Bed Bug Steamer to steam any cracks and crevices on the bed frame and slats. Then dust the same areas with Bed Bug Killer Powder to deal with nymphs that may hatch later, giving you instant and long-term protection. Used as recommended we guarantee instant and long-term protection from a bed bug infestation, or we’ll refund your money in full. Bed Bug Killer Powder: one bottle will treat a 3 bedroom home or 3 hotel rooms. 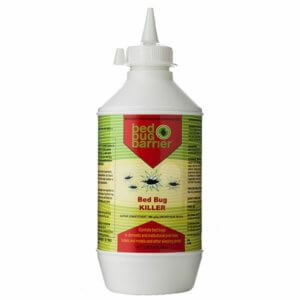 Bed Bug Duster: Applies the Bed Bug Killer Powder accurately and finely, reaching cracks and crevices with ease. Bed Bug Barriers: includes Floor Bed Bug Barrier, Screw In Bed Bug Barrier and Bed Bug Barrier Tape offer all the protection you need to trap bed bugs while treating your property with Bed Bug Killer Powder and for long-term protection. The primary goal of these barriers is to stop and kill bed bugs walking up bed legs. Bed Bug Mattress and Base Covers: trap bed bugs and their nymphs during treatment so they simply cannot reach their blood hosts, giving you instant protection. Bed Bug Steamer: get instant results with the steamer and boost your treatment efforts. The steamer is a critical component for success if you have slat bed bases. If you’re not sure of exactly what you need to eradicate bed bugs for your unique situation, call one of our experts on 1300 760 646. Don’t wait for a blood thirsty infestation of bed bugs to have you and your housemates cursing. Protect your property and red-blooded residents from bed bugs today. I can’t thank you enough for helping us. Have never had issue with bedbugs and then suddenly we had them in our home that we’d lived for 7 years. We tried everything, we tried all the natural remedies to get rid of them. Eucalyptus oil, steaming etc, etc, etc nothing worked. I google this product and thought we had nothing to loose. Used the product and next day no more bites and none since. I don’t normally reply to products I’ve used, but I just want to say thank you for yours. I went up north to Broken Hill for work and was getting bitten by something up there. I was stunned when I found the little bastards while changing my sheets. I have no idea where they came from and they were causing all sorts of ruckus – compromised relationships with housemates and waking up itchy in the middle of the night and then not being able to go back to sleep. The thought of bugs feeding on me overnight was disgusting and stressing me out greatly. I had been using surface sprays, the nasty stuff that kills cockroaches on my bedding and this can’t have been at all healthy, they are really resilient and the eggs hatch after surface sprays wear out. This product is basically a dust, and not a sticky or staining one either. I have used barely a third of the bottle it came in (I have tile floors, no carpet for them to hide in) and I haven’t been bitten in weeks. I had been fighting a constant, stressful battle for about 4 months until I tried this product, now they are gone and I am resting much, much better. 10/10 can and will recommend to anyone with Bed Bug issues – and the result of my research is that this may be needed as Bed Bugs are making a big comeback in the Developed world. Don’t be embarrassed, get proactive – I was stunned how easy it proved with the right product. We recently had a HUGE problem with bed bugs in the house. They are disgusting, and extremely difficult to get rid of. We stripped the carpets and threw out the bed/furniture in the room, but they were still there. Tried EVERY option we could find, nothing was working. We were about to bite the bullet and call an exterminator, but I came across this product and decided to give it one last shot. Wow, can’t believe the results! This actually got rid of the bed bugs, and they haven’t come back, either. I wish we would of found this product sooner; it would of saved us a lot of time and hassle. Definitely worth the price, highly recommend. I bought Bed Bug Killer powder. I had got 1 treatment with a pest control company but the bed bugs come back. After 2nd treatment, they still had come back, so I applied this Bed Bug killer powder in my house. I used 2 bottles for a 5 bedroom hotel unit ( I still have some powder left for 1 room ). After that, all bugs are dead. I actually have one more treatment as a last one of pest control company’s service but I think I don’t need their treatment anymore. No bite anymore, this is really amazing. Someone said that I would finally move out, but bed bug killer saved my peaceful life. I strongly recommend you to use this powder. I really appreciate your amazing product and peoples who invented this one. thank you soooooo much. I’m giving the bed bug killer powder as the only long term eco-friendly and family friendly solution to bed bug infestations. I was never going to let anyone spray chemicals in my bedrooms & expose my family & pets to anything non organically based. Bed bug killer powder is basically a type of sand that kills insects! The friendly staff member explained the company’s success rate & I guarantee this to everyone i know. You can eat this stuff! Which is peace of mind with pets & toddler’s in the picture. Great to use with any insect. I have been shopping around for bed bug solutions with my elderly mother who is very old school when it comes to pest control. After discovering pest controllers charge a fortune for bed bug detection & then spray chemicals everywhere with no guarantee for results, I had to find another way. A friend of mine suggested bed bug killer powder which is organic, lasts for years & gives a long term solution to this bed bug epidemic. In conjunction with protectors & barriers the system has garnished excellent results! The powder helps me sleep at night for more than one reason. Thanks bed bug barrier. eco friendly, non toxic solution to solve our bedbug problem. Works really well. No problems at all. It is very effective product and it worked very fast. After 2 failed attempts by pest controllers I thought I would give this powder a try. One week later no more bites. Strange to think a poisons free treatment worked better than the poisons the pest controllers used! I was sceptical about this product, because I have already tried so many. I figured I didn’t have much to lose, and this powder was my last shot. It truly amazed me. My fiancée and I dusted the powder in all the hiding areas around our bed, within a few days the bed bugs were gone. We both said to each other, “was it really that easy?”. I expected them to come back, but they didn’t. Truly a life saver product. Absolutely the best powdered product on the market for killing bed bugs. I’ve used numerous other products and have wasted time and money on them all. This is hands down the one that works – it’s fast and effective and really saved my house. My order arrived quickly and the product works really effectively. I like that it is eco friendly and pet safe.